Last week SAS Welding Services carried out some Custom Truck Fabrication for a regular customer from Charlton Mackerel in Somerset. They wanted a modified Aluminium Bull Bar fitted to their Scania V8 Lorry allowing for number plate and STGO badge. This was a repair and modification job, using TIG Welding. 3mm Aluminium sheet was cut and folded to make number plate trays, which were then welded in. This improved the look and offered support and protection to the number plate. Bull bars were set back in so they are flush with the folded aluminium trays. 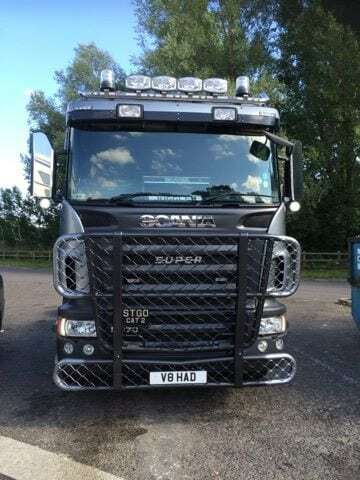 SAS Welding Services carry out all kinds of Truck Customisation so if you are in the Somerset area and want some custom fabrication please get in touch to discuss your requirements with no obligation.